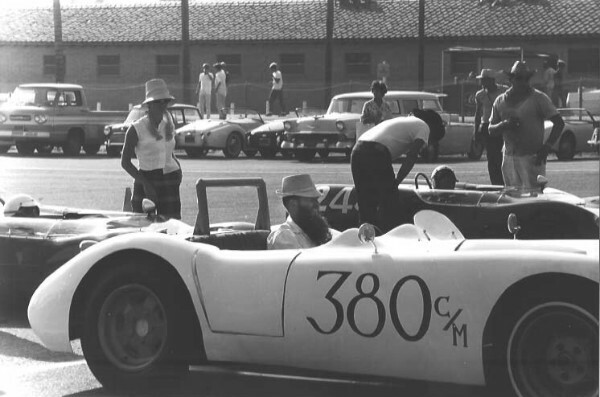 The bearded Leonard on the grid at Del Mar in 1963. This car was one of the last flathead powered Specials to compete in California. 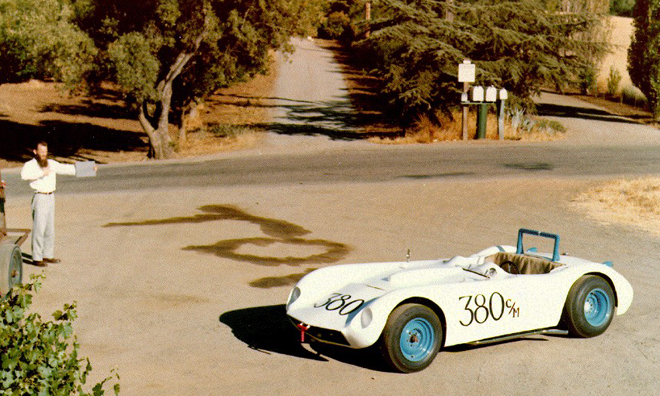 Historic racer Dave Seely identifies the fiberglass body as a "Kellison J4 Roadster body". A throwback to a much earlier era of racing, Leonard's Special dwarfs Frank Monise's Lotus 23 in the foreground. Behind Leonard is Tom Handelson's Corvette powered MGA. Photo submitted by Mark Leonard: "In case it’s of interest to you, I’ll attach a picture of him standing by his car, holding an 18% grey card to calibrate the color photo. I took this picture before Highway 280 took a slice from our orchard in Los Altos, CA." "The Leonard car has an early Kellison J4 roadster body. I substantiated this with Jim Kellison before he died by email and telephone. Also, the car ran a Ford V-8 early on, but by this time was running the y-block according to a friend of Tom Leonard's. I am hoping to get more information on the history of this car. Please feel free to put my contact information on your website for any lurkers that might have some info on this car. We have pieces to the puzzle but not much else." so any details about the car are a bit stale in my memory. condition, and I believe has run it in some vintage car races. in the car, but as far as I know Tom always had a flathead Ford in it. This was the series that was introduced as 85 horsepower, later with a rating raised to 100 horsepower. As noted, the car had a Kellison fiberglass body, attached by 3 or 4 bolts so it could be removed easily. The frame was of steel tubing, which Tom welded to make the frame. In front it had a straight beam axle, and it had swing axle independent rear suspension. Most of the drive line and suspension parts were of the same vintage as the 1947 Ford he drove on the street. It had inboard drum brakes in back, with the differential, brake drums and universal joints packed very close together, inside the roll bar supports. Needless to say, the Ford rear axle hardware required extensive machining to change to a swing axle. However, the unsprung mass was quite low. There’s a funny story about the roll bar. Some years earlier there had been a fatal accident when a car’s roll bar failed during a rollover accident. 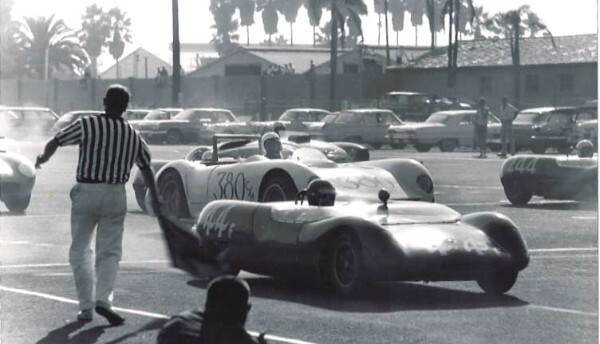 The roll bar was found to have been made of exhaust tubing, and SCCA officials insisted that a small hole be drilled in every roll bar so they could verify that the roll bar tubing was thick enough. Tom resented that they would require him to prove his roll bar was strong enough, so he drilled a bit larger hole and welded in a piece of steel tubing as long as the diameter of the roll bar. He carefully ground down the weld, so it looked like he’d drilled the required size inspection hole all the way through a solid steel roll bar. have in place during competition. I don’t have any contact information for Dave Seely, so if he’s still around and you know how to contact him, he might like a copy of what I’m sending you.